It was water activities for me today. In the morning, we went fishing. 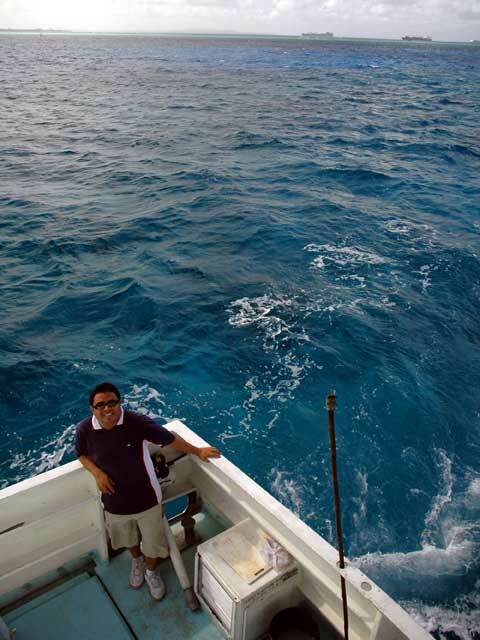 The Marianas Visitors Authority had arranged for us to join a fishing trip offered to tourists. 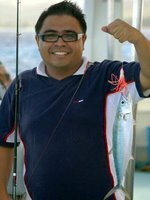 As always, there were Filipinos in the crew of the fishing boat. The fishing rods and bait are provided on board. We arrived at the port in time for the 9 a.m. departure of the boat. 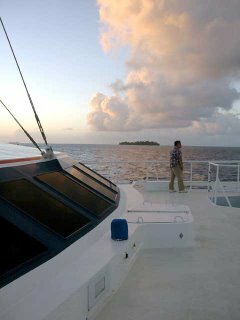 The trip to the fishing area near Managaha Island was about thirty minutes. The water was so blue and so clear, you could see the white sand at the bottom. As soon as we anchored, the captain of the boat gave us a signal when we could drop our lines. We had approximately an hour before the captain would ring the bell again for us to stop fishing. This was one way to relax and enjoy the blue waters off the island of Saipan. The only thing I wasn't happy about was the fact that it was a bit short since I enjoyed the great ocean views as well as the warm breeze that hit the boat. We were back at the port shortly before 11 a.m. where the MVA vehicle passed by for us. 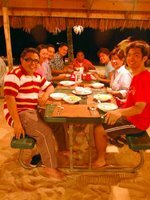 We then joined the Probe Team crew while they were interviewing another successful Filipino businessman in Saipan. Aside from a hardware store and small department store, he also owned the only Jollibee Store on the island. Yes folks, Jollibee is already in the Marianas! And we dropped by to check out the products. It was weird seeing your favorite Chicken Joy and Regular Yum quoted in US dollars. 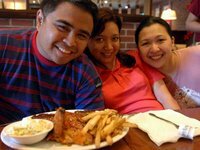 Lunch was at Tony Roma’s. This time, I made sure I didn't eat too much so I ordered salad. 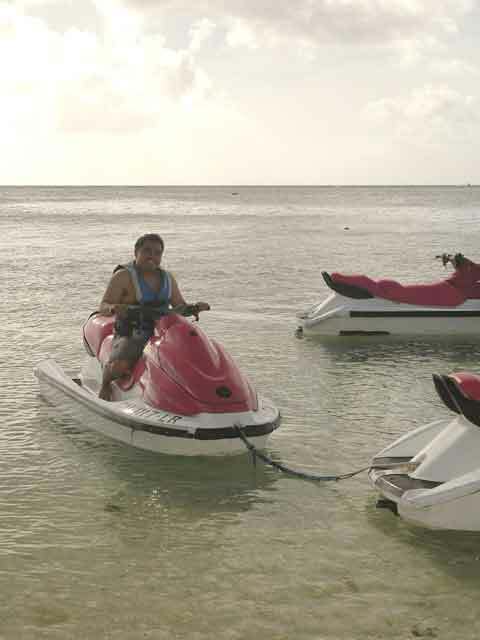 Our plan for the afternoon was more activities in the water courtesy of the Saipan Grand Hotel. 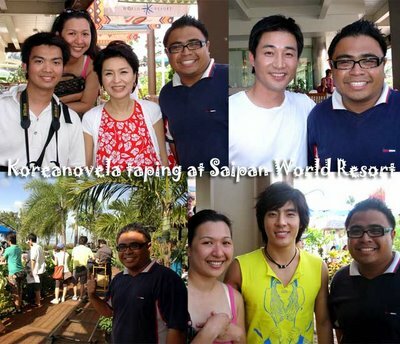 But we first joined the Probe crew at the Saipan World Resort to watch a taping of an upcoming Koreanovela. Check out the previous entry for more details. Since the hotels are beside each other, we simply walked back to our hotel via the beach, for our appointment with the jetskis. It was so much fun! After a few minutes on the jetskis, we went snorkelling to check out the remains of some tanks near the hotel beach. 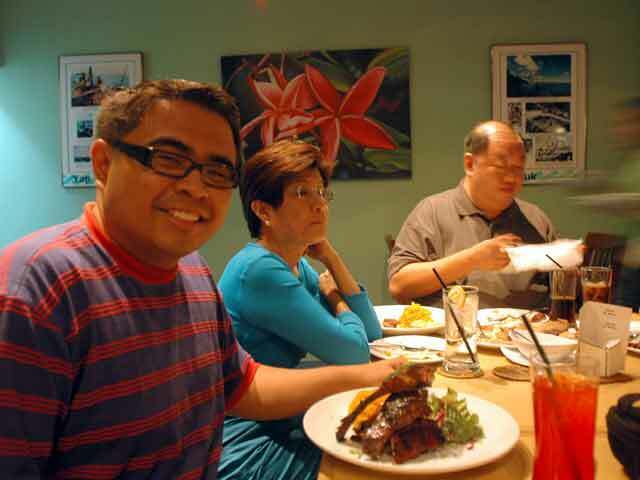 Dinner was at D’Elegance Café, another Filipino restaurant which insisted that they invite us for dinner. After that, it was a short walk to the shopping areas such as DFS, Urban Outlet and Paseo de Marianas. 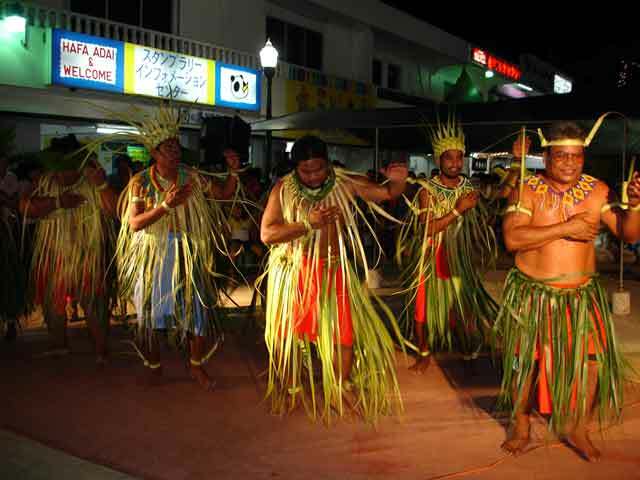 Every Thursday, the Paseo de Marianas is very much alive because of a Chamorro cultural show and night market. I hope we have cultural shows like these in our tiangge areas such as Greenhills, Market! Market! or Tiendesitas since it is an added attraction for tourists and locals alike. I really felt I was in the Philippines while I was walking around since you could hear Filipino being spoken all over the place! Plus, most of the stalls at the night market were owned by Filipinos and you could see so much Filipino food such as dinuguan, bopis, arroz caldo, laing and even grilled delights such as barbeque, tenga ng baboy, adidas, etc. I was also surprised to see tupig being roasted there too! It turns out, it is known locally as apigigi and might have been brought there long ago by immigrants from Pangasinan. 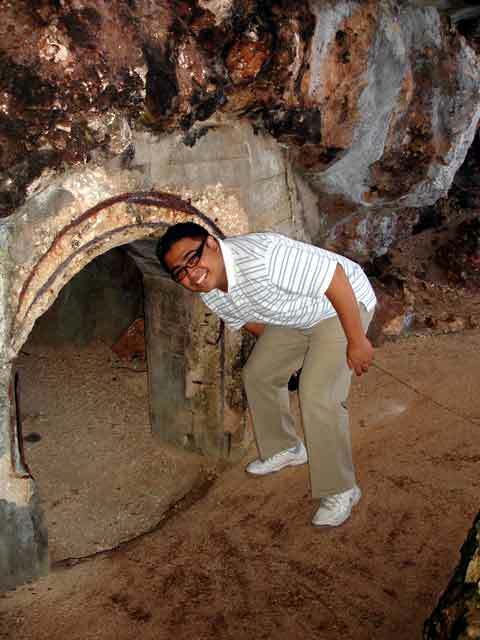 But what made Saipan different from the Philippines was that it was much cleaner. For some reason, Filipinos when abroad, follow the law. I wonder why we can't do it here, especially the littering part since if everyone puts his garbage in the right place, we won't have have problems such as unsightly piles of garbage. Oh well! Check out my photos at http://ivanhenares.multiply.com. 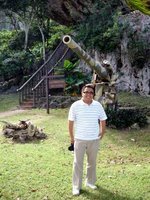 Northern Marianas: Koreanovelas are shot in Saipan! 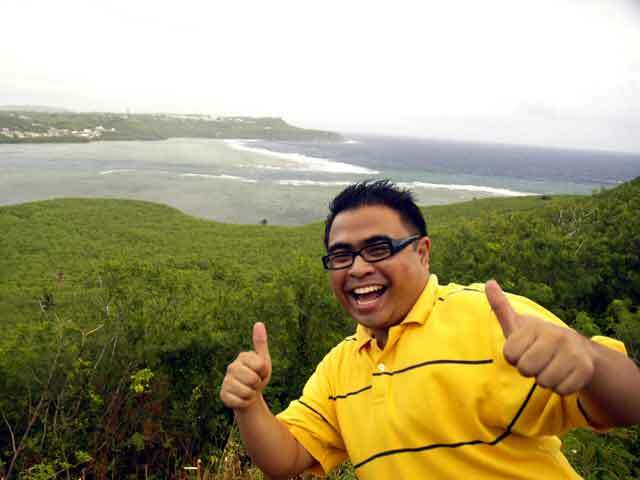 I had another fun day in Saipan today. We went fishing in the morning and jetskiing in the afternoon. But right after lunch, we watched a taping of an upcoming Koreanovela entitled "Nice Woman, Bad Woman" at the Saipan World Resort. And we also got to take photos with the stars who included Lee Jae-Ryong, Sung-Hyun Ah and Jun Jae-Yong. It turns out there are a lot of Koreanovelas shot here in Saipan. So if you're a die hard fan of these Korean soaps and can't afford a trip to Korea, you can catch your favorite Korean stars here in Saipan. 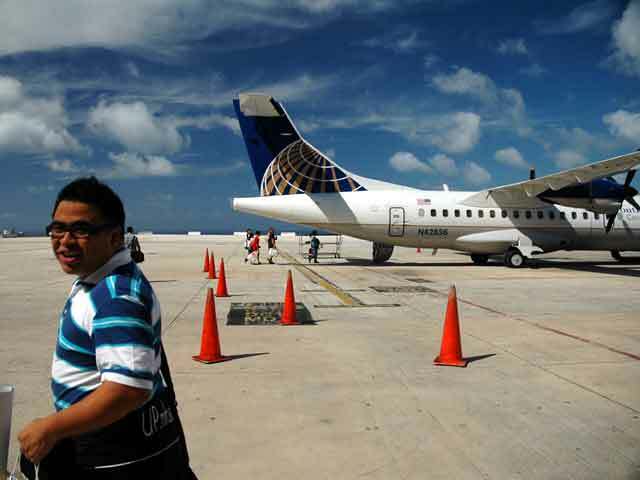 There are direct Continental Airline flights from Manila to Saipan so start planning your trips. Hehe! 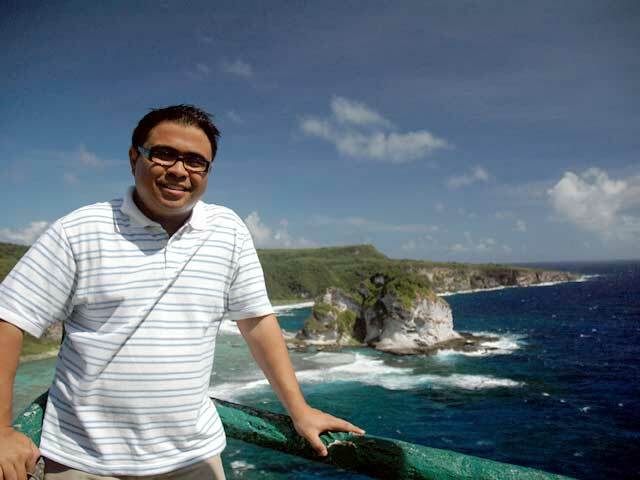 Just contact the Marianas Visitors Authority in Manila at (02) 8481512 for more information. I'll blog in detail when I have the time. But for now, I need to get some rest. Hehe! So in the meantime, check out my photos at http://ivanhenares.multiply.com. OT: Please vote for the documentary of my brod RG Publico for BBC Best Documentary of the Year. The title is Sierra Leone: The End Of A Nightmare. Last day to vote is December 4. To vote, click here. 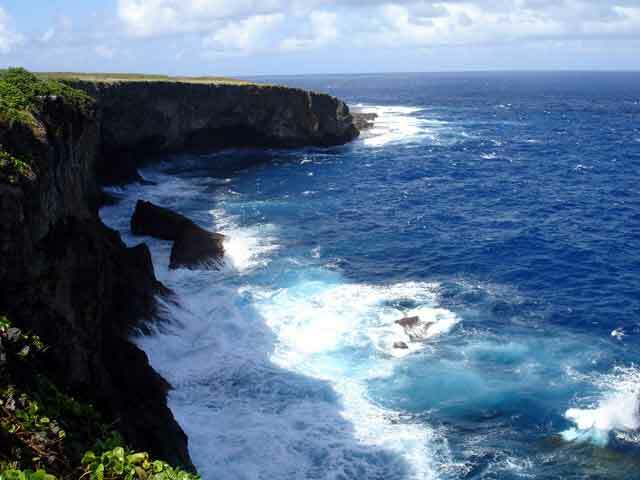 The Northern Mariana Islands were witnesses to the poignant events of the Second World War. 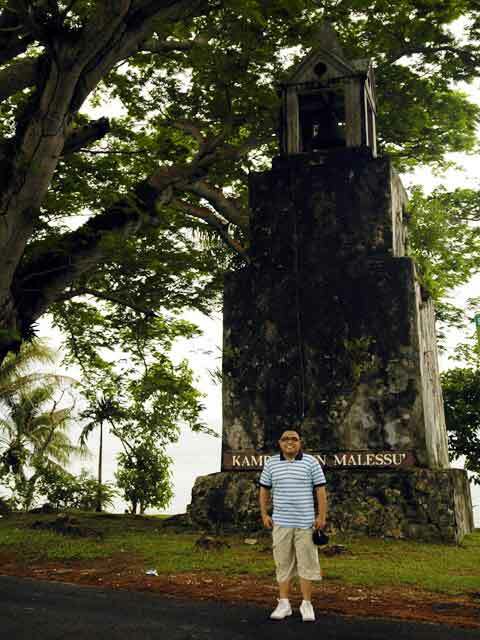 From shipwrecks and rusted tanks off its shores to the sites of fierce battles and tragic episodes, the Marianas stand as a memorial to this sad chapter of world history. Among these sites is an airfield on the island of Tinian, where the B-29 Superfortress bomber Enola Gay set forth on its mission to drop the first atomic bomb on Hiroshima. 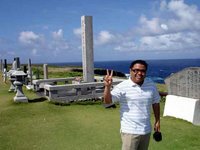 Today, we visited several sites and memorials on the northern tip of Saipan. After breakfast at the hotel, the group first made its way to the Marianas Visitors Authority where we met with their managing director, Perry Tenorio. After the brief courtesy call, it was off to the Last Command Post in Banadero Cave, which is next to the Okinawa Peace Memorial, just below high cliffs. It was here that General Yoshitsugo Saito ordered his men to take seven lives for the emperor, then committed suicide. In front of the memorial are World War II relics including a light Japanese tank and several guns. From the Last Command Post, we went to Suicide Cliff, an 800-foot cliff where hundreds of Japanese soldiers jumped to their deaths rather than surrender to the invading American forces. Simply looking down at the bottom of the rock face and imagining the drop was eerie. The group then made its way to the Bird Island. 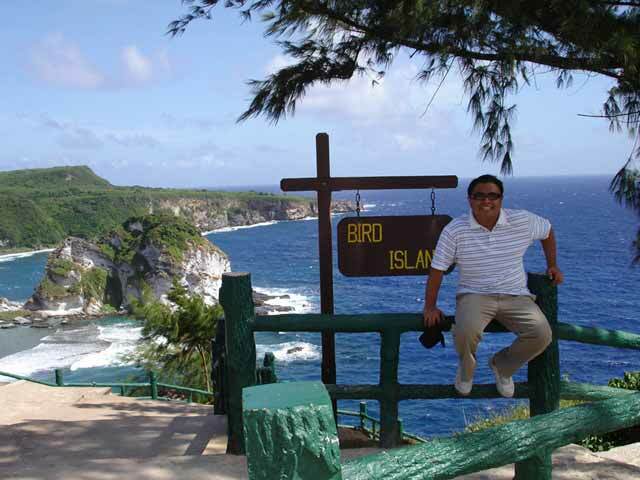 Known as Islan Maigo Fahang or "island of sleeping seabirds" to the locals, it is a small stone islet in a secluded emerald bay that offered a stunning view to visitors. We made a brief stopover at the Grotto, a deep limestone cavern which is connected to the ocean by several passages. 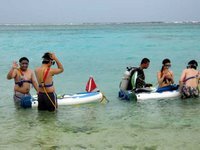 It is a thrill for scuba divers who are out for adventure. The entrance also forms a natural pool that is also a popular swimming area. As locals say, it’s like swimming in the ocean sans the sunburn. It was quite tempting to take a dip, especially seeing the other tourists having so much fun. But we weren’t there to swim though and moved on to our next destination which was Banzai Cliff. 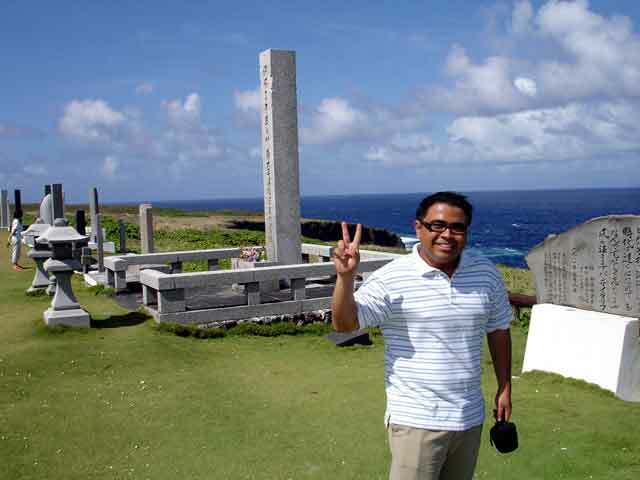 A breathtaking bluff overlooking the ocean, visitors to Banzai Cliff would be oblvious to its tragic past if not for the markers and memorials commemorating the sad event which took place there. Japanese civilians, encouraged by Japanese troops who told them that they would be killed and raped by the Americans, committed suicide from this sea cliff. Women and children plunged to their deaths in plain sight of American soldiers who pleaded with them in Japanese not to jump. Lunch was at a popular restaurant and café called Coffee Care. 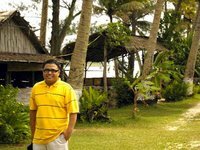 One thing I liked about the place was its picturesque view of the ocean and Managaha Island, a really great place to relax and unwind. It’s also a haven for web addicts like me, since there is free Wi-Fi Internet access. For my meal, I ordered Blackened Chicken, which was pan-fried boneless chicken breast seasoned with cayenne pepper, Cajun seasoning, garlic and wine, served with fresh tomato salsa and linguine aglio olio. As we were waiting for our meals, they served us cream of broccoli soup while we played around with the crayons on the table, unleashing our creativity with the doodles we made. After that filling lunch, they brought us gargantuan servings of their mouth-watering desserts. We then made our way to the south of the island, right beside the airport to visit the remains of the Bomb Storage Magazine. While the rest of the group was taking shots around, I was initiated by the staff of the Historical Preservation Office into the betel nut chewing culture of the islands. Known as nganga to us Filipinos, the betel nut, mixed with lime and pepper leaves is a potent source of euphoria for those who like chewing on it. After a minute or two, I felt a surge in my body temperature as my body released a sudden flash of sweat. I was floating as we made our way back to the hotel. We just had a few minutes to freshen up and get dressed since we had to rush to the port for a dinner cruise on board the yacht Stars and Stripes. We arrived just in time for the 5 p.m. departure. What a way to cap the day, watching the sunset on a cruise! On board, a Filipino performer rendered some songs in various languages since we had Koreans and Chinese on board. The guy really knew how to entertain and we had so much fun listening. The food was great too! They had salads and chicken, beef and fish on the buffet table. While the bar served flowing drinks such as soda, juices and beer. Dancing followed dinner and it was obvious that all the passengers were having a blast! 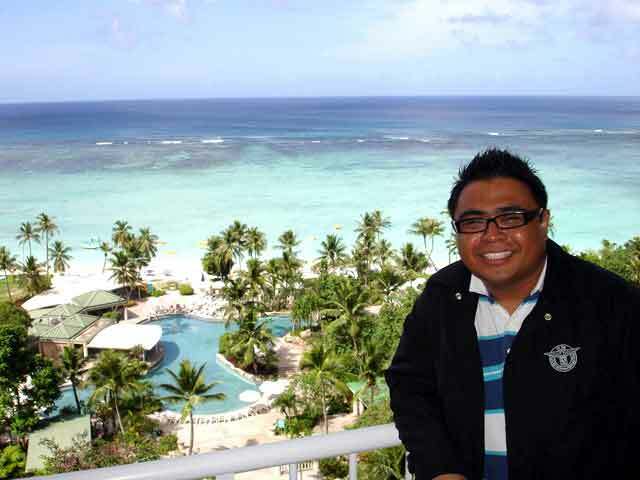 We then made our way back to the Saipan Grand Hotel to get some rest for even more activities the next day. Photo credits: Karlo de Leon who took most of my photos, Jodi Madridejos and Cheche Lazaro. I've been quite busy here in Saipan so to keep you entertained, here are photos of me eating betel nut or nganga to us Filipinos. Yikes! I didn't realize chewing on it gives you a high! Today, we left Guam for Saipan. Our flight was in the afternoon so we had some last minute meetings before we flew out. After breakfast, we made a courtesy visit to Walter B. Dias, the Staff VP for Sales and Marketing of Continental Airlines. After the visit, we were invited to visit the Hyatt Regency Guam to check out the facilities and savor their sumptuous buffet lunch. The view from the rooms was picturesque! 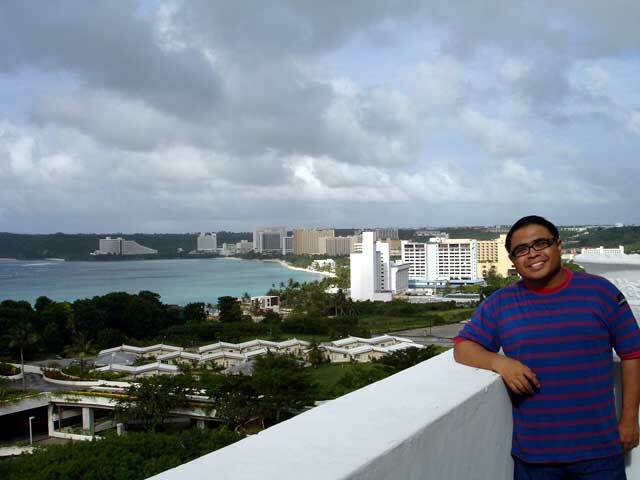 All their rooms are actually on the side of the beach and thus get a wonderful view of Tumon Bay. Lunch was at La Mirenda Retaurant. Everyday, the theme of the buffet changes so expect to try out something new. For today, it was Mexican so I had nachos and made my own burrito with guacamole in it. But the pièce de resistance was actually their dessert table. Yummy! We were running late and had to rush to the airport. The counters were actually closed when we got there but they let us in anyway. We were already late, but when we placed our bags on the weighing scales, everyone was overweight no thanks to the shopping! So all of us were frantically opening our luggage and taking out stuff. Good thing Lou gave us a travel bag from Continental so we were able to balance out the stuff between the two bags. Whew! 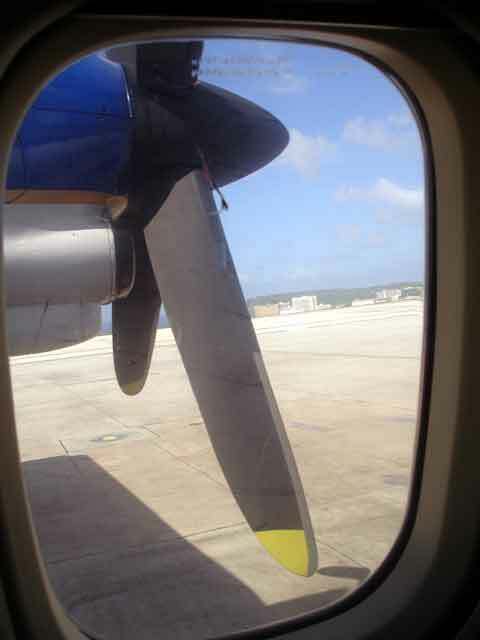 The plane is actually a 42-seater ATR42/72, the ones with the propellers. I already had some misconceptions about these planes and was pleasantly surprised that it was a smooth flight since I had motion sickness. In fact, I was asleep for the most part. 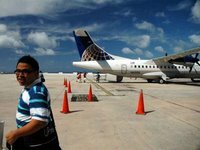 We landed at the Saipan International Airport at about 3:30 p.m. To get into the Northern Marianas, you either need a U.S. visa or a visitor's entry permit. 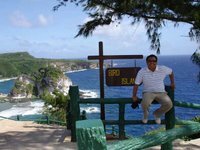 You could get an application form at the Marianas Visitors Authority office in Manila and fax it to CNMI Immigration. Forms can also be downloaded at the website of the CNMI Attorney General's Office. 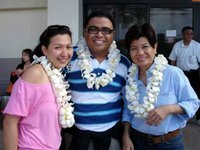 We got a warm welcome when we got out the airport courtesy of our hosts, the Saipan Grand Hotel. They gave each of us plumeria leis which really smelled good. From the airport, we went to the hotel. But they took us for a brief drive around the island center in Garapan first. Our rooms had a really great view of Susupe Beach which was right beside the hotel. The group had a lot of time to rest since our only activity today was dinner. So after getting settled, I went down to the beach to swim a bit. We had a BBQ dinner at the beach. The atmosphere was so relaxed and we had our feet on the sand. They served us salads, roasted oysters and mussels and steak. They also let us try Tinian chili. I dipped the tip of my fork in it to try it out. Wow! The effect of that very small amount was overwhelming since the chili was just soooooo hot! The great thing about this hotel was that they had free Wi-Fi internet access at the lobby! Hehe! Anyway, time to sleep now. Lot's of stuff to do tomorrow. Today, we visited Tumon Bay, one of four protected marine reserves of Guam. Tumon Bay is actually the area of the hotel row which is why visitors residing in the hotels could easily access it. Our plan was to snorkel from the Ypao Beach Park. Instead, we found ourselves going snuba diving, which is a mix of scuba diving and snorkeling since although you have the oxygen tank, the tank is floating on an inflated raft above the surface. It was a good thing Snuba, a company which offered this great activity, had clients on Ypao Beach that day. So we were able to join in. 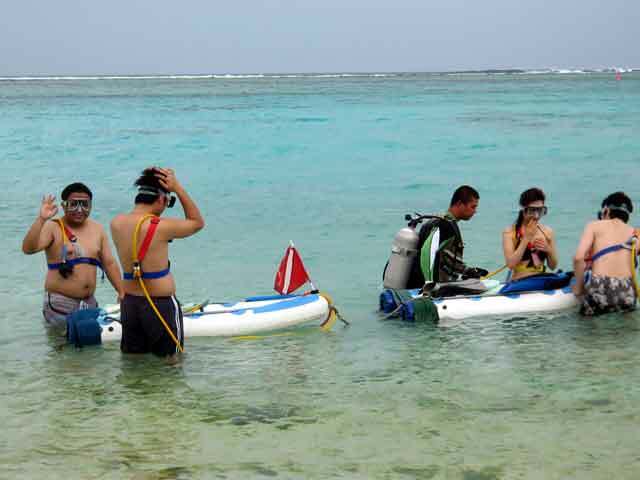 A thirty minute snuba tour around the reefs of Tumon Bay would cost you about US$65 per person. We got ourselves some underwater cameras yesterday night. It was a great deal since we got the reusable ones with flash for just US$15 at K-Mart. So you just have to change the film when it's done. So I'll post the photos of our snuba trip once I get the photos developed. There was a lot of marine life in the reef. Not as much as the deeper reefs but going snuba in Tumon Bay was a good introduction to scuba for a beginner like myself. The fish aren't scared of people since no one is allowed to go fishing in this protected area and they are used to people too. I think I'll try the real scuba diving one of these days since checking out the marine life was really fun! I didn't expect it to be that tiring though because when I got out of the water, I was so exhausted. My throat was dry too! We had to rush and get dressed since we had to catch the rest of the group for lunch at Tony Roma's at the SM Store. 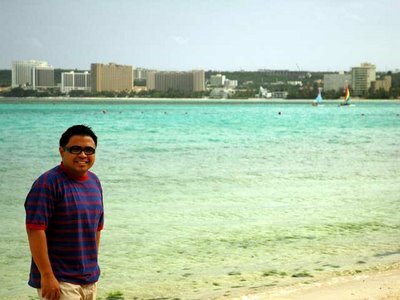 Yes people... Henry Sy has landed in Guam! 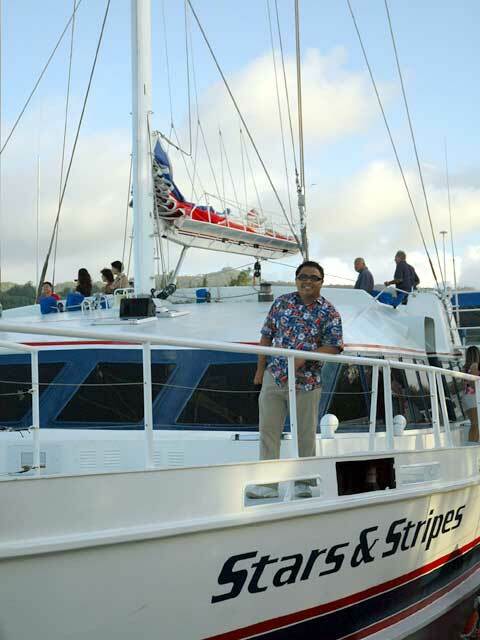 It was hosted by SM Store GM Tes Reyes and the marketing heads of Continental Airlines and the Guam Visitors Bureau namely Lou Sanchez and Pilar Laguana. My lunch really accelerated my food binge. Talk about American servings! I had a large serving of ribs and chicken, coleslaw and a mound fries all in one plate! And to think I had tortilla chips and salsa before the main course. I decided to take a nap after lunch since I didn't want to go shopping anymore plus I slept quite late the night before since I was maximizing my Internet access which was US$15 for 24 hours! So they brought me back to the hotel while the rest went shopping or were doing more interviews. 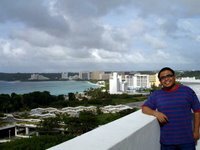 From the balcony of my room, I took some photos of Tumon Bay. Really great view! 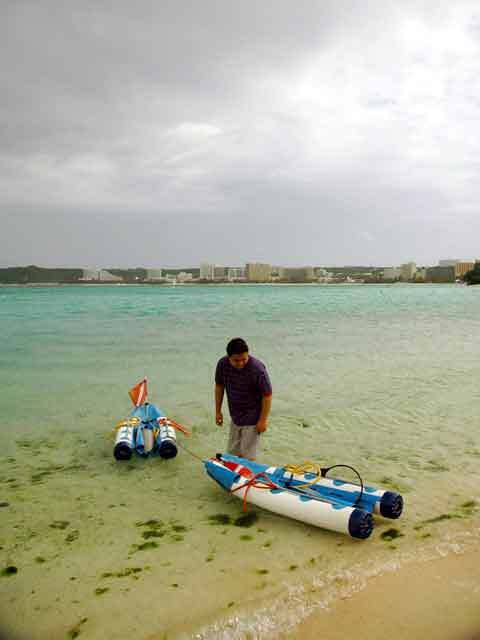 It's a really good thing Guam was able to take care of its environment which is why you have these really blue waters right beside high-rise hotels. For dinner, we met up with successful Filipino businessman Emilio Uy at Proa Restaurant. Again, another large plate for dinner. I could feel my stomach and my face expanding! Mr. Uy was the owner of a very large office supply store in Guam and was very famous for his generosity to visiting Filipinos. He even sent us some pasalubongs at the hotel. We had to rush back to the hotel since Probe had to interview Cueshe, a popular Filipino band, who was in Guam for a week for some gigs. Cheche Lazaro did the interview and we got to listen in. We found how they started in Cebu and the gamble they took by coming over to Manila without any assurance of gigs and all; how they lived in a single apartment, living on canned foods and noodles. Well, obviously their gamble paid off. After the interview, I went up again to my room since I wanted to maximize the remaining minutes of the Internet connection. Haha! We leave for Saipan tomorrow. OT: The M/S Nippon Maru is now docked in Manila. 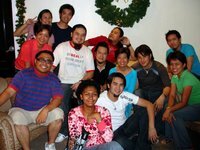 And I missed the SSEAYP reunion on board the ship! Oh well! I will have to wait for 2008 since it's not docking in Manila next year. Thanks to SSEAYP International Philippines for the SIP National Award for Arts & Culture. 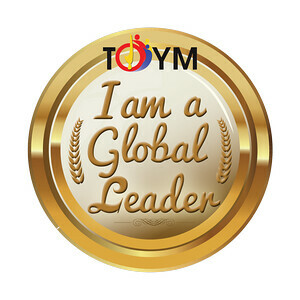 I apologize for not being there to receive the award personally since I'm still working here. Thanks again! Today we visited the southern end of Guam. It was raining since the tip of a storm was passing through Guam. After breakfast at the hotel, we made our way eastward towards the Pacific side of the island. We stopped by the Mangilao Golf Club to check out the view of the Pacific coast and take some photos. Notice the hand gesture? 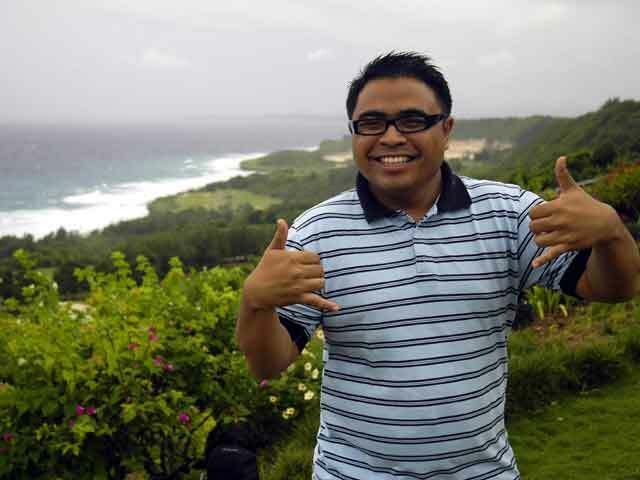 That's the sign for Hafa Adai which is Chamorro for hello. From Mangilao, it was a southward drive towards Talofofo. But on the way, we checked out the jungle cruise port but the boat had just left. 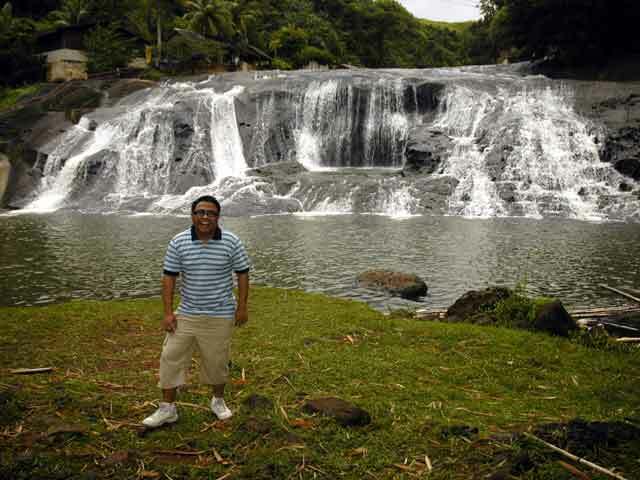 There are two schedules, one at 9 a.m. and another at 1 p.m.
Our next stop was the Talofofo Falls Park. Talofofo Falls is one of Guam's popular tourist attractions. 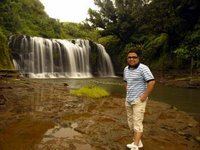 A privately owned area, the entrance fee for tourists is US$20 which includes a two-minute cable car ride down to the falls and back, the amusement park, and a visit to Yokai Cave. The cave was the hiding place of Sergeant Soichi Yokoi, a Japanese soldier who hid in the Talofofo jungles for 28 years following the defeat of the Japanese in World War II. He was finally captured in 1972 and returned to Japan where he was given his back-pay. From the depiction on the wall, you could see that the cave was actually a small bunker 2.5 meters below the ground, 1 meter high and 1.5 meters wide. We took the cable car down to the waterfalls area and hiked around. There are actually two waterfalls. Several rope bridges allow visitors to walk across the river to get around the falls area. From Talofofo, we passed by Inarajan which we visited yesterday. We stopped at the Saluglula Pool which was a popular swimming area with a two-meter deep natural pool popular for diving. This pool was protected from the strong waves by several rocks. We made our way to Merizo which was celebrating its village fiesta that day, known as Fiestan Tasi. Among the interesting sites in the village is an old convent which is now a school as well as a bell tower. There is also a replica of the image of the Our Lady of Camarin, the patroness of Guam, right in front of the church plaza. Merizo Port is also the jump off point for Cocos Island, a very popular beach among Japanese tourists. 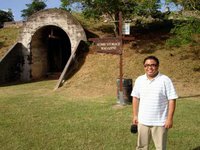 From Merizo, we went to Fort Nuestra Senora de la Soledad in the village of Umatac. 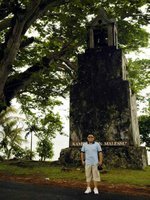 Umatac Bay is said to be the landing site of Ferdinand Magellan in 1521 which is why a monument to him could also be found in the village. 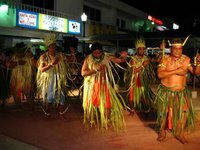 In 1565, Miguel Lopez de Legazpi arrived in Umatac, claiming the islands for Spain. 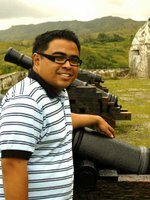 This would start the long intertwined history of the Philippines and Guam since the Marianas were governed by the governor-general in Manila. Umatac Bay was very important to the Manila Galleon Trade since it was the last replenishment stop before the long voyage to Acapulco in Mexico. 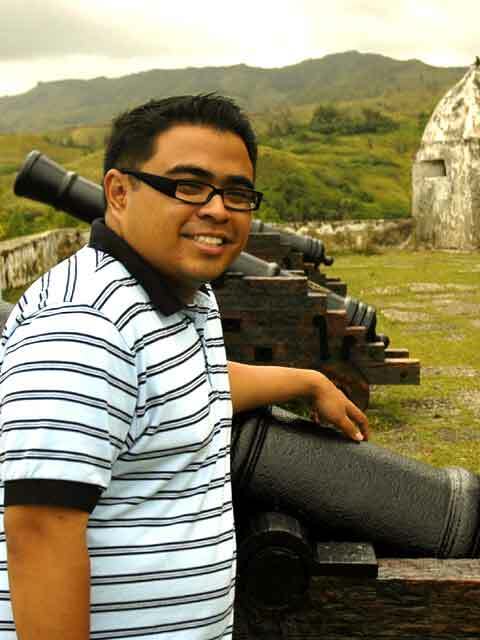 Which is why from 1680 to 1810, several fortifications were built to protect the galleons from pirates and privateers. The last of the four forts constructed was Fort Soledad. It was already close to 2 p.m. and we realized we hadn't had lunch yet. So our driver took us to a popular Filipino restaurant in Tamuning which is actually an institution in the Filipino community of Guam. 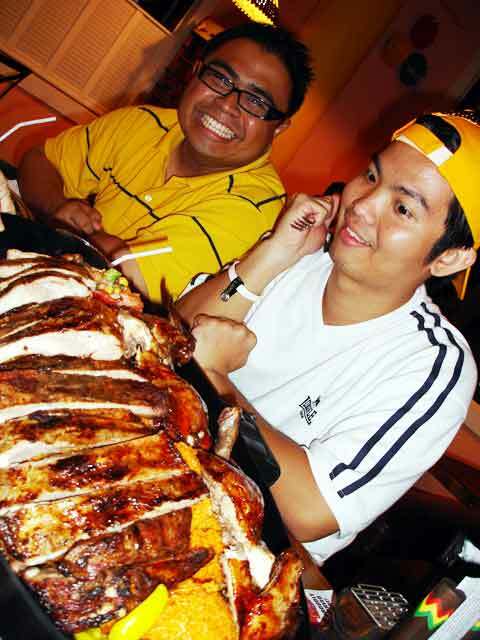 Opening its doors in 1987, Rambie’s is said to be the longest-running Filipino restaurants in Guam. 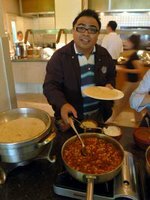 Serving Pinoy favorites such as kare-kare, sinigang, caldereta and dinuguan, the restaurant uses the turo-turo concept, enticing customers with its colorful display of different dishes. From Rambie's, we made our way to the Hyatt in Tumon to pick up the Probe crew who had done interviews the whole day. From there, we went back to the hotel to freshen up for a dinner cruise. But the sad part was the boat cruise cancelled due to the storm. So we decided to go shopping. Our first stop was Micronesia Mall which is owned by none other than Lucio Tan. I guess the Philippines is completing its invasion of Guam with the arrival of shopping malls. Yes, Henry Sy has his own stake on the island as well. Jollibee is there too and so is San Miguel! After Micronesia Mall which closes at 6 p.m. on Sundays would you believe, we went to K-Mart which was open 24 hours. Anyway, more tomorrow. 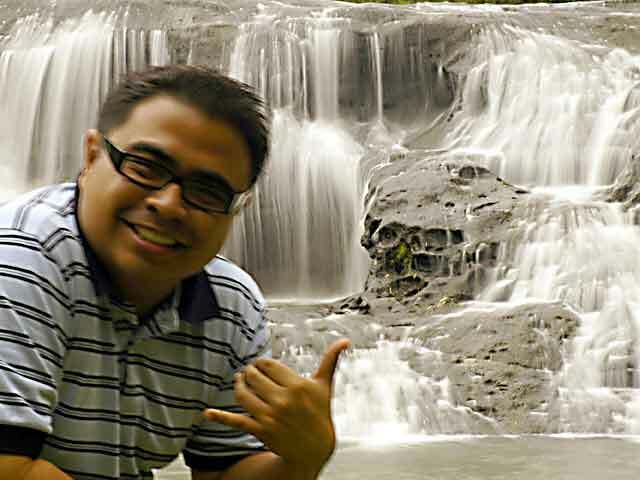 Hafa Adai from Guam! Today was a full day for me since I’m on a familiarization tour of Guam courtesy of the Guam Visitors Bureau (GVB) and Continental Airlines. Have tons of work to do here for Pilmap Travel & Leisure. So watch out for the December 15 issue. I left Manila yesterday night at 11 p.m. I was at the airport early since I had to get my ticket at the Continental office at the 4th floor of NAIA. Good thing we were given invitations to the MIASCOR Lounge so I was able to relax a bit, check my mail while waiting, eat some dinner and drink a few glasses of red wine. The rest of the group had left the night before. And last night, only myself and Probe Team host Cheche Lazaro were on our way to Guam. 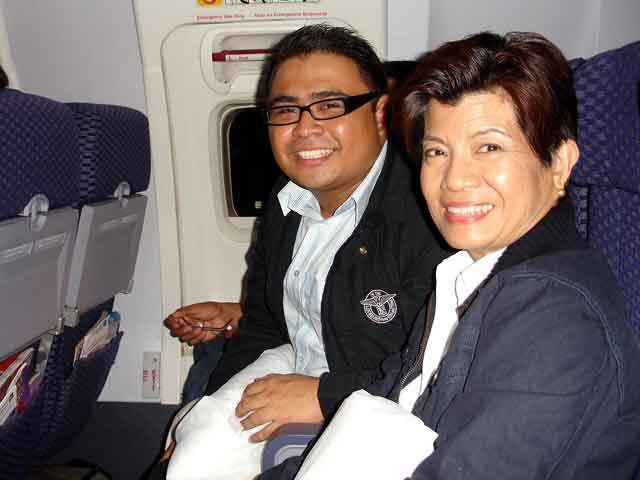 I got to chat with her since we were seatmates as well on the plane. We arrived in Guam at 4:20 a.m. which is two hours ahead of Manila time. That meant we had less than three hours of sleep! Good thing our call time for the day was still at 9:30 a.m. so we had time to sleep some more before we buckled down to work. 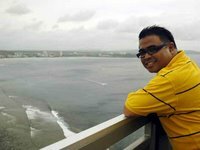 The group was billeted at the Royal Orchid Hotel, a four-star hotel in Tumon which is quite near the airport. The rooms are great. It was funny too because the bathroom area is as big as the sleeping area since it had a dressing room, etc. And you could slide the bathroom windows so that you could watch TV while you’re in the tub. I was up at 8:45 a.m., took a quick shower and went straight down for buffet breakfast at the Brooklyn Café. Then we were off. 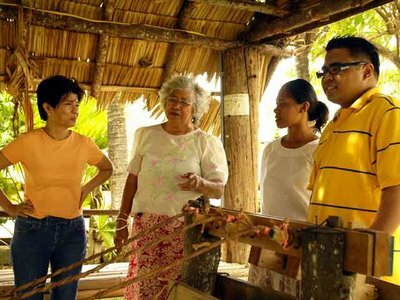 Our first stop was the Gef Pa’go Chamorro Cultural Village in Inarajan were we were given an introduction to the Chamorro way of life. There were several huts which featured various aspects of Chamorro culture such as salt making, rope twining, katupat weaving, etc. They charged US$10 per person. The village, just a few huts and nothing fancy, was quite ordinary. But you learned a lot since the experience was hands-on. Imagine, we could do something like this in the Philippines such as in the Cordilleras or in Mindanao. And it could help preserve the culture since the income from tourism would encourage the indigenous communities to preserve and showcase their culture. From the village, we walked towards one of the old houses of the village. You could see how much they value their heritage since, for Philippine standards, this was just an ordinary old house. 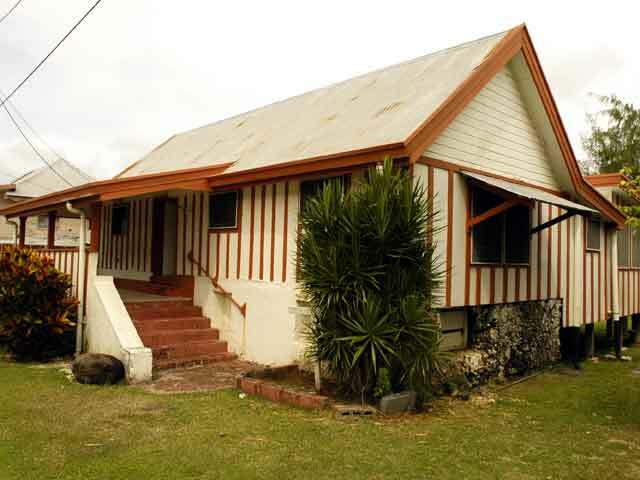 Yet it was listed in the registry of heritage houses both in Guam and the United States because it represents the common folk, the Chamorro people. In the Philippines, commoners’ houses would most probably not be considered as heritage houses by the NHI since they may not fit in their criteria as “exemplary” examples of Philippine architecture. The house had a little marker inside made of wood designating it as a heritage house both locally and nationally; unlike at home wherein the NHI, at times, has to consider its budget first before declaring a structure since the cast iron markers are expensive. I hope the NHI just keeps on declaring heritage houses since unlike the other categories such as national shrines, monuments, landmarks or historical sites, I feel that the criteria for heritage houses should not be stringent since we are declaring based on cultural significance rather than historical accuracy. And the more we declare, the more we preserve, the better! One thing I was also surprised to see was that the matriarch of the house was in a terno! Check out this photo. 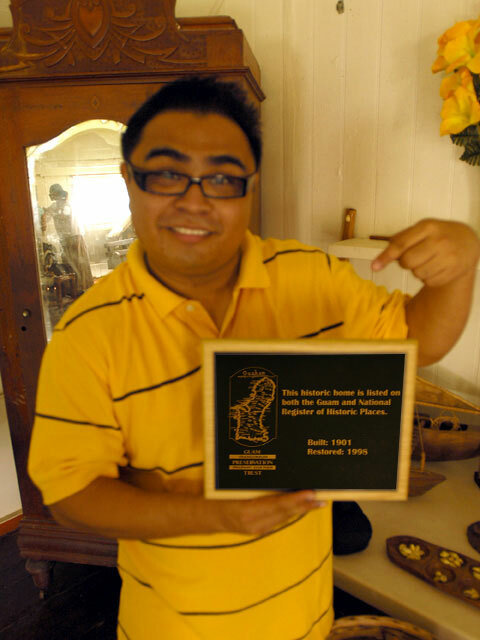 It just shows the deep-rooted connections between us Filipinos with the Chamorros. Anyway, from the house, we walked to the nearby St. Joseph’s Church. For a village church, I was surprised that it was air-conditioned inside. 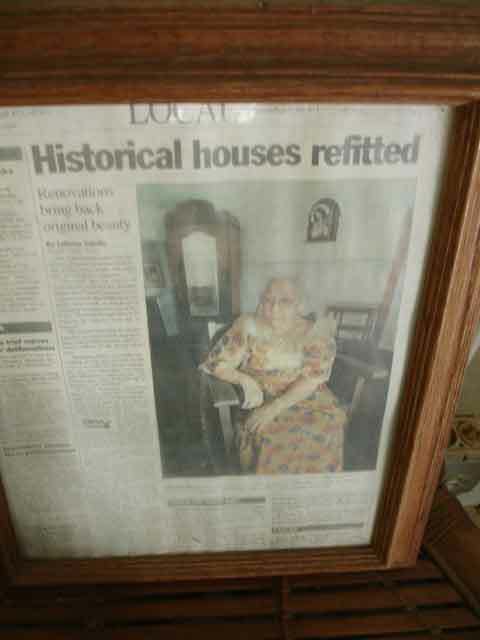 There were stained-glass windows portraying the different patron saints of the villages of Guam. We went back to the Gef Pa’go Village to have lunch. The community served us traditional Chamorro food, a fiesta plate consisting of spiced ground chicken, fried chicken, pancit and java rice. There was so much to eat since everything on Guam was American-sized servings so that was two pieces of fried chicken and close to two cups of rice! 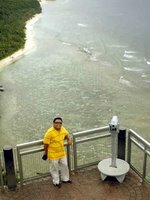 Our next stop was the Two Lovers Point in Tumon. But we made a brief stopover at Yoña at the viewpoint for Pa’go Bay. 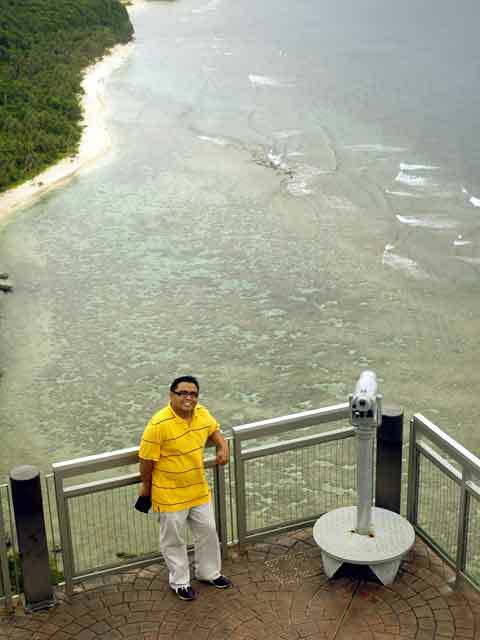 Two Lovers Point is one of the more popular tourist attractions of Guam. 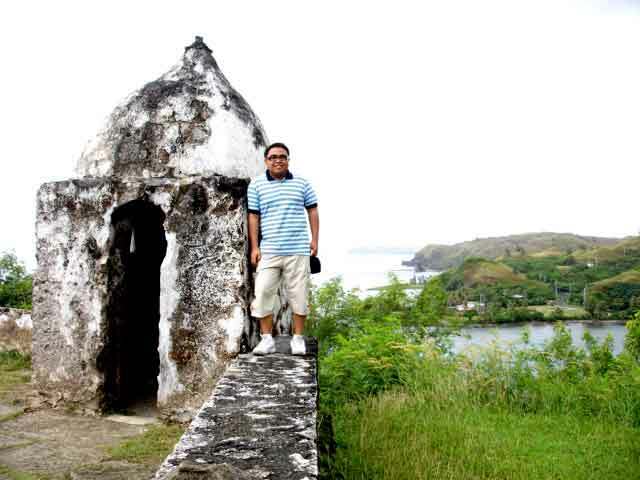 Aside from being a scenic spot, it has a legend attached to it, a tragedy with a Romeo and Juliet-like plot. It was about two lovers who chose to end their lives together by jumping over the cliff rather than living separate lives. The girl was a daughter of a Spanish aristocrat and a Chamorro woman of noble lineage. Her father had arranged a marriage with a Spanish captain. Learning about this, the girl ran away from Hagåtña (Agana) until she found a secluded shore. 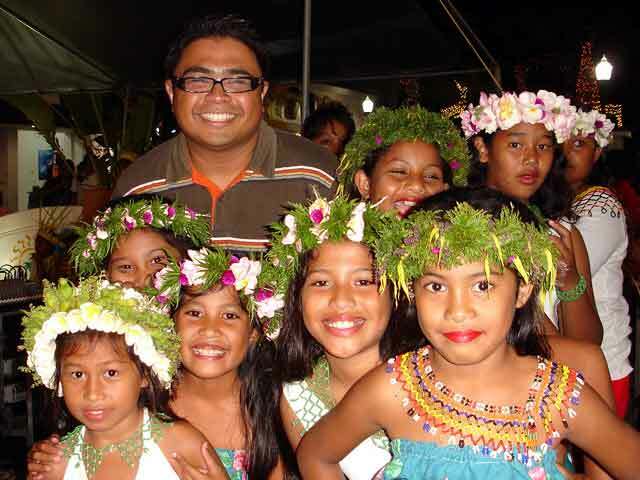 There she met a Chamorro warrior from a modest background. They immediately fell in love with each other. Upon learning of the relationship, the father demanded that the girl marry the captain immediately. That same day, she ran to the same spot to meet her lover. They were pursued until the tow were cornered and trapped between the edge of cliff and the soldiers. Seeing that they could not escape, the tied their long hair into a single knot, looked at each other’s eyes and kissed for the final time before jumping to their deaths from the cliff. The father could only but rush and stare in aguish at the waters below where only their knotted hair was seen floating. The two became a symbol of true love, the knot a symbol of two souls intertwined in life and in death; which is why the cliff is called Two Lover Point. From the cliff, visitors are afforded spectacular views of Tumon Bay and the downtown Tumon area. 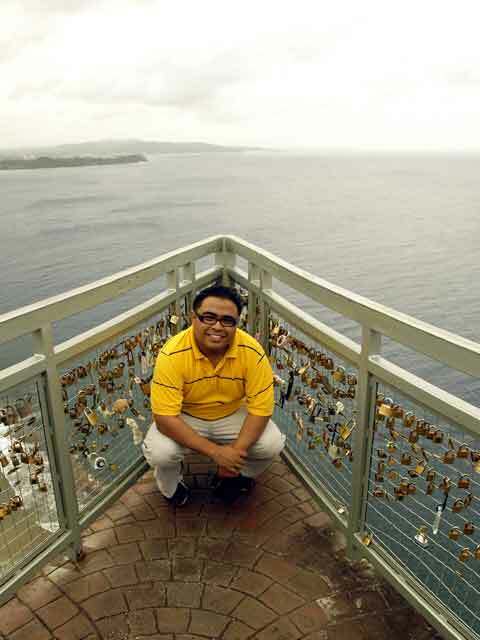 At the top of the cliff, you would notice several padlocks attached to the grill. These were placed by lovers as a symbol of their love for each other. After the padlocks are locked to the grill, the keys are thrown over the cliff and down to the water. Some couples have even chosen this location for their wedding. From there, we proceeded to Underwater World. This 800,000 gallon aquarium has a long viewing tunnel made from a special acrylic 2.5 inches thick. 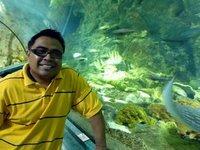 It is home to various species of sharks, stingrays, turtles, groupers which weigh as much as 500 pounds, and thousands of other ocean animals. On the second floor is a sea life gallery which features unique and rare species such as garden eels, giant spider crabs, stingrays, and even a bamboo shark at the touch pool. 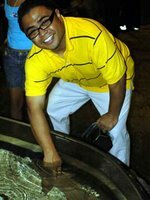 Yup, I got to touch the shark. But hear this! In the evening, the tunnel is transformed into a popular nightspot called Kaitei Lounge. Tables and chairs are set up in the tunnel where exotic cocktails are served to guests. For the evening, we visited two festivals. 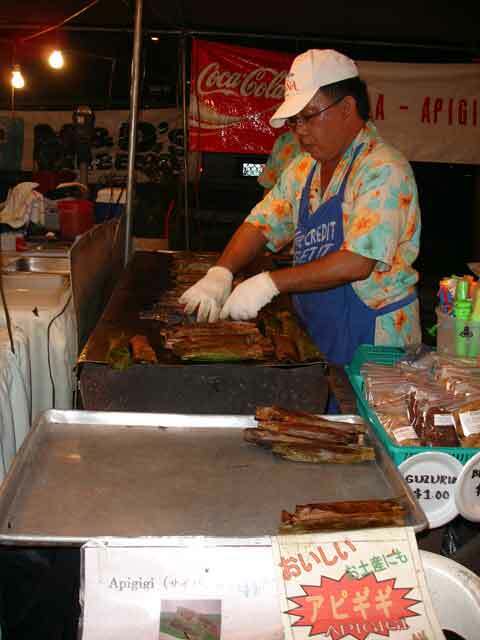 The first was the Christmas Festival in Hagåtña and the lighting of the big Christmas tree as Skinner Park. I was touched by the sense of community of the people since even if it was raining, everyone stayed to watch the program under their umbrellas. Good thing it stopped raining while the program begun. 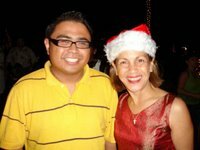 We also got to chat with Madame Joann Camacho, the first lady of Guam. Although born in Guam, her father is from Bataan. Our next stop was the Annual Autumn Festival at Ypao Park in Tamuning organized by the Japan Club of Guam. It was packed full with people despite the rains earlier. It was a chance for the Japanese of Guam to showcase their culture. Aside from the performances, many of the performers came straight from Japan, there were food booths offering various Japanese favorites while the game booths kept everyone busy with traditional Japanese games. Although our plan was to eat dinner there, we decided not to since there were just so many people. So we went back to the hotel to put down our stuff and we walked to the next building to eat at Jamaican Grill. The food was great! We had roast chicken and pork ribs with their special sauce. That’s it for tonight. We have a lot of activities tomorrow. It's easier to update my photos so just check my Multiply page for the latest photos. OT: Atienza is getting greedier as ever. Now he plans to erect a statue of Manny Pacquiao in the Baywalk when he's very much alive! Shame on you Lito Atienza, using Manny Pacquiao's popularity to get votes for your son! Check out this Manila Standard editorial. I even hear there is a plan to rename the San Andres Sports Complex after him! Let me remind these politicians of Republic Act No. 1059, An Act Prohibiting the Naming of Sitios, Barrios, Municipalities, Cities, Provinces, Streets, Highways, Avenues, Bridges, and Other Public Thoroughfares, Parks, Plazas, Public Schools, Public Buildings, Piers, Government Aircrafts and Vessels, and Other Public Institutions After Living Persons. Gone are the Quezon days when politicians could name cities after themselves. 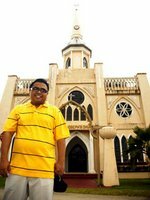 Manila: What is wrong with Manila?